The Department of Mathematics and Systems Analysis at Aalto University is located at the Otaniemi campus in Espoo, under ten kilometres from the centre of Helsinki. We are at Otakaari 1, the main building of the Otaniemi campus. From Elielinaukio (central railway station) in approx. 25 minutes, take bus 194 or 195. Get off at the stop "Alvar Aallon puisto", a few minutes' walk from us. During rush hour the bus ride may take longer. From the bus stop it pays to walk around the campus library ("Otaniemen kampuskirjasto") and enter the main building through the Y entrance (see the map below) and walk up one set of stairs. For local bus connections and timetables, please see the HSL Journey Planner, give Otakaari 1 as the address. 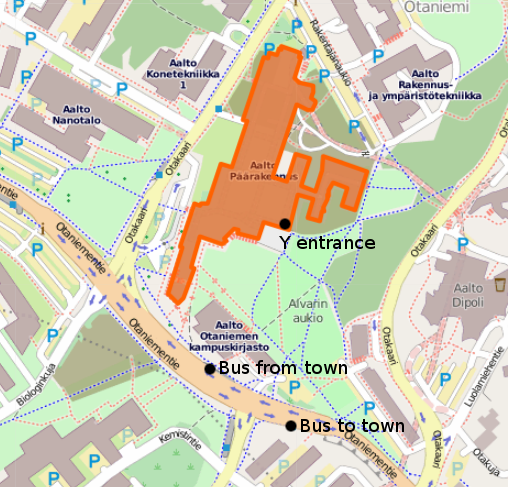 Further information on the Aalto University How to get to Otaniemi page. A taxi from the Helsinki-Vantaa airport costs approx. 40 € and takes about 25 minutes in good conditions. The closest hotel is the Radisson Blu Hotel, Espoo in Otaniemi. There are some guest rooms which you can reserve through the university, e.g., at the Aalto Inn in Otaniemi or the Töölö Towers closer to the centre of Helsinki.